Sjoberg Tool & Mfg. is a family owned job shop, celebrating their 40th anniversary, located in Hartland, Wisconsin where they have been a long time supporter of Mazak laser technology. They purchased their first Mazak laser in 1992, but they currently have three Hyper Turbo X 3015 4kW laser-cutting machines, one MKII 3015 4kW laser, one SPACE GEAR 3015 4kW and their most recent purchase being an OPTIPLEX 3015 4kW Fiber. Sjoberg Tool & Mfg. also has two types of automation in their facility, an Flexible Manufacturing System and an Extensible Manufacturing Cell allowing their operators to do other tasks instead of loading material onto the machines. With their new fiber technology, they have learned about the increase in speed that fiber delivers compared to CO2. Sjoberg's new OPTIPLEX Fiber is allowing them to cut 10-guage steel at twice the rate of their CO2 laser and the fiber is even quicker in light-gauge materials (Davis, 2016). Sjoberg Tool & Mfg. also has many other pieces of high-end equipment such as Schroder SPB Evolution, SafanDarley E-Brake, and a material sorting racking system by Big Steel Rack. Continuing to strive for the best equipment helps keep Sjoberg competitive and stay ahead of the curve. 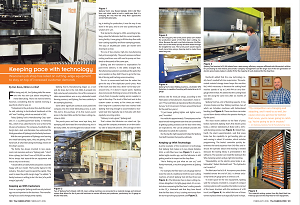 Full article written by Dan Davis and published in the February issue of The FABRICATOR.